A while back, Jack O’Connor (Chief Engineer) and Ian Barnes (First Assistant Engineer) offered to take the members of the Expedition 335 science party on a tour of the Engine Room. The tours proved so popular that practically the whole science party signed up. That meant that Jack and Ian had to give a total of three tours, because some of the spaces they took us through couldn’t accommodate more than about ten people at a time, and a bigger group wouldn’t have been able to hear what they said over some of the loud machinery. But Jack and Ian said they were happy to give the extra tours, so we all got to go. Each tour group met in the conference room, and we were all reminded to bring along our hard hats, safety glasses, and earplugs with us. From the conference room, we walked to the Engine Control Room, where Jack and Ian explained all the systems they use to monitor the various machines that keep the JR running – providing our electricity, air conditioning and heating, drinking water, etc. The Captain and his crew use a Dynamic Positioning System to keep the JR in location over the hole where we’re drilling, and it’s these powerful thrusters – along with two propellers – that nudge the ship back into position when it moves off the desired location. 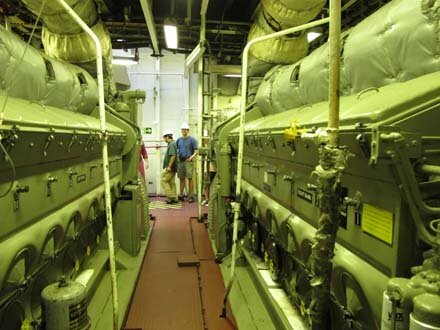 This is where you find the ship’s five huge main diesel engines, lined up all in a row, like five great hulking beasts. Each engine can produce up to 2100 kilowatts of power, or 3000 horsepower. To put that into perspective, a 2011 Ford Ranger pickup truck has just 143 horsepower! These five engines, plus two smaller engines, can combine to produce a total of 13.5 megawatts of power.